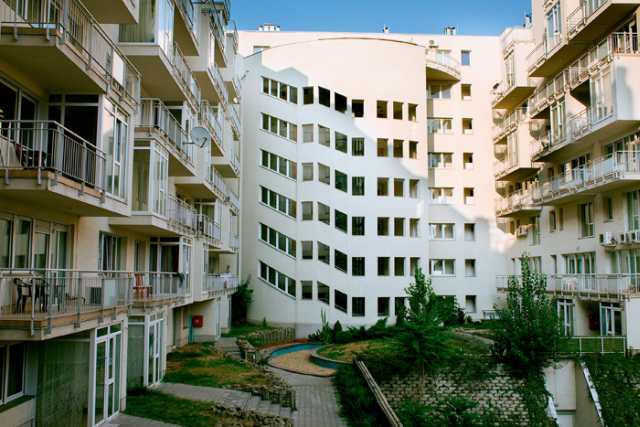 location: Agape apartments is well located in the popular Jewish district in the middle of the city. Close to many of the cities best restaurants and bars and within a 15 minute walk of the river Danube. Many of the cities best attractions are within walking distance and there is a underground station and tram stops just 200 metres away. rooms: The apartments are simple, bright and clean with fully equiped kitchens with microwave and fridge. The laminate floors and all of the new furniture make the rooms look modern. The kitchen and bedroom space is all open plan so the apartments do not feel too small. All apartments are en-suite, have satelite TV and a view on to the street. restaurant: There is no restaurant but the Agape Apartments is surrounded by a huge choice of restaurants and cafes. Guests are able to buy a croissant and a coffee for just 1 euro from the reception should they want to. exterior: A modern 4 storey apartment building with large glass entrance. lobby: This is a residential building so there is no formal entrance lobby on the ground floor. The apartments reception is on the first floor and signs clearly lead guests to this for check in. The reception is open 24 hours a day and the helpful staff can order transfers, tours and anything else the guest may need. general: These are really very pleasant 2* apartments. Ideally located for anyone wanting to be in the middle of town and wanting some independence. Hair dryers and iron are available free of charge on request from the reception.